Adapted from Rachael Ray and Cook’s Illustrated Recipes. I am feeding a crowd today. Jan’s brother and cousin are coming, both with +2, so nine diners in total. The last time I did a shepherd’s pie it made enough for 6 diners. I will have to scale up my recipe and use a large baking pan, rather than my usual casserole. I prefer a shepherd’s pie with a chunky stew underneath, but Brother Dee is on a soft food diet. I am planning a minced meat and vegetables stew shepherd’s pie. This will make it easier for him to eat. Most shepherd’s pie include peas, but I do not particularly like over cooked peas. I substituted small cut green beans to replace the peas. I blanch and put them in at the end with the red pepper to prevent them from breaking into mush. I had wanted to do an Indian variation of shepherd’s pie, gobi aloo and chicken curry. My guests prefer standard American food. Now that I have it written up, I will make that another day and post it. After Dinner Note: When I tried to put the stew into the pan I had planned to use, I found that it came up too high. If I had tried to add the potatoes, the stew would have spilled over the top and created a mess. I used my largest pan, but when I put the potatoes on they did not quite cover the stew. 1. Put the dried mushrooms into a small bowl and add ¼ cup of boiling water. Set aside. 2. Peel and chop the potatoes into medium, even chunks. Put them in a large pan and cover with water. Add the salt and put it on the stove. Do not turn on the burner at this point. 3. Prep and measure and reserve all of your ingredients at this point. 4. Heat a deep, large skillet over medium-high heat. Add olive oil to the skillet and brown the hamburger. Remove to a bowl when done and reserve. 5. Without cleaning the pan, sauté onions over medium high heat until just starting to pick up some color (about 5 minutes). Tip: If you are using very fatty hamburger, you may need to remove some of the excess grease. 6. Turn the potatoes on to high heat at this point. When they come to a boil turn the heat down to medium. 7. Add the carrots, celery, and cabbage. Continue sautéing until softened (about 5 minutes). 8. Scrape the vegetables to the edges of the pan and add the garlic to the hole. Sauté the garlic until it is fragrant (about one minute). Stir into the vegetables. 9. Drain the mushrooms fluid into a cup and chop the mushrooms fine. Tip: Reserve the mushroom fluid to add later. Let the liquid settle and pour off the top, leaving any debris behind. 10. Add the mushrooms, bay leaves, paprika, thyme and pepper to taste into the pan. Pour some of the mushroom fluid into the pan and cook until most of the fluid has cooked away. 11. Stir in the hamburger and gravy and bring to a simmer for a few minutes. 12 by this time the potatoes should be close to being done. Tip: When the potatoes are done, a knife will slide into the largest piece easily. 13. Remove the potatoes with a slotted spoon to a colander, but reserve the hot water. 14. Add the green beans to the pot and blanch them for 4 minutes. Drain and reserve the beans. 15. Return potatoes to the pot. Set the pot back on the burner for 1 minute to evaporate excess water. Remove from the burner and set aside. 16. In a small bowl, beat the egg into the milk. 17. Rice the potatoes into a large bowl. Tip: A potato ricer looks like a very large garlic press. I consider it a must have to produce smooth, fluffy potatoes. 18. Add a couple of spoonfuls of potato and the melted butter to the milk mixture to temper it. Fold mixture and the chives into the potatoes. Cover and set aside. 19. While stew is simmering, set the oven rack to 5 inches from the broiler element and preheat oven. 20. Stir the green beans and red peppers into the stew. 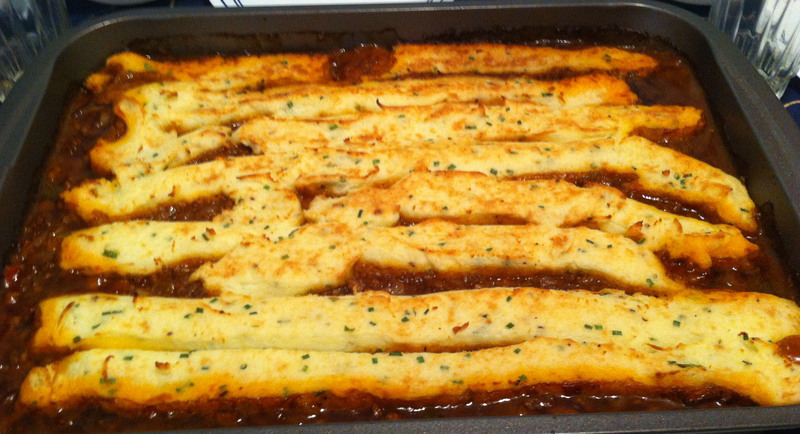 Pour the stew into a large wide casserole or baking pan. Tip: You want to use a baking dish that is large enough to leave at least ¾ of an inch between the top of the stew and the lip of the dish, so that you can put the potatoes on top without them spilling over. 21. Put the potato mixture into a seal-able gallon plastic bag. Cut a corner off of the plastic bag and pipe the potatoes over the stew. Use a spatula to smooth out the potatoes to cover the stew completely. 22. Using a large serving fork, drag the tines over the potatoes to make decorative groves. 23. Place casserole in the oven and broil until the potatoes are golden brown and crusty (about 15 to 20 minutes). 24. Let cool for 10 minutes before serving.